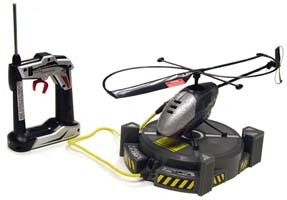 Air Hogs is well known for its impressive line of good, solid airborne toys. Their earlier air-powered and RC planes have been well received, so a move into the world of whirlybirds was a natural progression. The Sky Patrol R/C Helicopter looks the business when you see the image on the box. However, like the images in fast food restaurants, the contents didn't quite live up to the pictures. Not only are the runners on the box replaced by four legs on the actual model, but the nice plastic finish that we are lead to believe we were going to get turns out to be badly painted polystyrene that looks nothing like the slick model in the image above. This was something we couldn't understand, as the previous Air Hog models have been polystyrene, but have been well painted. But we ignored that slight oversight as the thing would spend most of it's time in the air (we hoped - you haven't seen our hand to eye co-ordination. And no jokes about not being able to keep our chopper up!) so an aesthetically pleasing finish was not necessary. A huge plus point (assuming you have the batteries to hand to work the charger and remote control) was that this was really easy to charge and have flying almost as soon as you open the box - unlike most remote control toys that require the battery to be charged for at least a few hours. And the charger is not some monstrously ugly black box. No, Air Hogs has cleverly designed a charger that doubles as the launch/landing pad. So, when you take this out for the day, all you need is the charger, the remote control unit and the helicopter - obviously. A word of warning though, for those who are expecting a full multi-channel control system - you don't get one here. And neither should you expect to at the price. The actual flying is easy to get the hang of. And, while you don't have total control of the direction of flight, as long as it is a calm day you shouldn't have too many problems. It is also totally safe for even the youngest child to take control of. And should the helicopter be taken on the wind there is a cut of switch that stops the blades rotating so that it lands quickly. And believe me this switch comes in handy, especially when you are flying at over 15 metres above the ground. And should the worst happen, and you crash, the polystyrene construction ensures that it is protected. The rotor blades are also designed so that should they come in to contact with anything they won't break easily. And another positive point is that everything fits back snugly in the box to ensure that it won't get damaged once you have finished playing with it. Hours of fun is guaranteed. It's just a shame the product doesn't look as well polished as the image on the box.